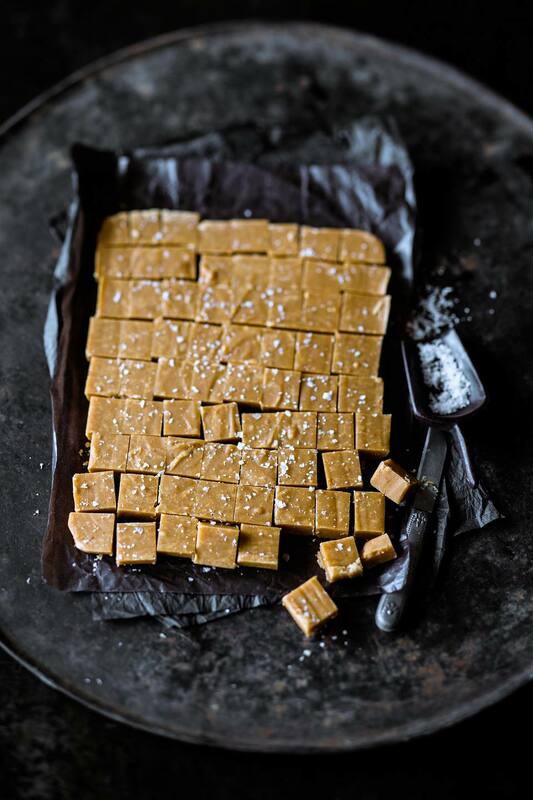 Brown butter fudge is a twist on traditional butter-based fudges. The butter in this recipe is browned first, to give it a slightly nutty, caramelized taste. The end result is a smooth, sweet fudge with a little extra something that perks up the taste buds. Place the butter in a medium-large saucepan over medium-high heat. Melt the butter, stirring occasionally, and continue to cook it until it is a rich, golden brown. Monitor the butter as it cooks, and stir it every few minutes so that it does not scorch on the bottom. The butter should smell toasty and have a beautiful nutty color. Once the butter is browned, add the sugar, evaporated milk, and corn syrup. Stir until the sugar dissolves then insert a candy thermometer. Continue to cook the candy until it reaches 235 F (soft-ball stage) on the candy thermometer. Once the proper temperature is reached, remove the candy from the heat, and allow it to cool at room temperature until it is lukewarm, about 45 minutes. Once the candy is barely warm to the touch, place it in the bowl of an electric mixer fitted with the paddle attachment. (The fudge can also be beaten by hand or with a hand-held mixer, but the process will take two or three times as long). Beat the candy until the fudge becomes thick and creamy and loses its shine. Do not over-beat, or the fudge will be grainy. Quickly stir in the vanilla and the nuts, if using. Pour and scrape the fudge into the prepared pan; smooth it into an even layer. Allow the fudge to set at room temperature or in the refrigerator. Once set, cut it into small squares and serve at room temperature. Store remaining fudge in an airtight container or bag at room temperature for up to a week, or store refrigerated for 2-3 weeks.